Welcome Readers !! You are now on the index page of www.mngogate.com a website dealing with some issues of language, science and philosophy. I have not used highly technical terms. I present some English (series E) and Marathi (series M) articles. My brief biodata, as well as some English and Marathi links are given at the end of this Index page. Marathi articles are in Devanagari script in pdf format. Their titles are given here in Roman script. Click on titles. Short English theme (with symbol =) is given along with each title, for notice of search engines. M15 maraat'hi vidnyaan parishadech'e kaarya = Activities of Marathi Vidnyan Parishad. 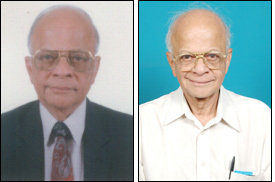 M16 vaidyak patrakaar d'r suresh naad'karn'i = Health Journalist Dr. Suresh Nadkarni. M17 vidnyaan sammelanaatle kisse = Anecdotes of Vidnyan Sammelans. M18 maraat'hi vidnyaan parishadechaa vistaar = Growth of Marathi Vidnyan Parishad. M19 vidnyaanpremi prasanna vyakti d'r raa.vi.saat'he	= Eminent Dr R V Sathe. M20 suchanaasaar = Gist of suggestions. M22 maraat'hisaat'hi roman lipi chinhe va namune = Roman script symbols, examples for Marathi. Some useful links --- (E) English text (M) Marathi text in Devanagari script (lipi). I am Madhukar Narayan Gogate. I am a retired structural engineer born in 1932. I know Marathi (mothertongue), English, Hindi, Sanskrit. I lived in Mumbai until 1996, currently residing in Pune (India). I have visited UK, USA etc. I am a founder and past president of Marathi Vidnyan Parishad. I was a convener of some joint programs of Marathi Vidnyan Parishad Pune Vibhag and Institution of Engineers Pune Centre (during period 2002 to 2009). I have given number of talks on various topics at some Colleges, Schools, Clubs, Radio and TV. Please email (text only) in (1) English (2) Marathi, Hindi in Roman or Devanagari (unicode) script . My email address is (mng1932@yahoo.com) preferable, and (mng1932@gmail.com). Phone (020)24537574 and (020)24539275. Postal Address - 4 Pavan Apts, Lakshmi Park, Navi Peth, Pune 411030, India. (MNG Glimpse of Research in Engineering Press here ). Visit article E17. It is about my proposal on English Spelling Problem. Article E06 is on science popularization by Marathi Vidnyan Parishad (I am activist from start in 1966). (b) Sounds and their frequencies vary from language to language. Choose Roman symbols to suit respective needs. Do not adopt an over-precise script which is complex and burdensome. (d) Hindi and Marathi are written in (almost common) Devanagari script. Many words are common. Hindi-knowers, unfamiliar with Marathi, can judge say 50 % sense of Marathi text, in Devanagari or Roman. Science is known as vigyaan in Hindi, vidnyaan in Marathi. (e) Contents transferred to article E16 . (f) Request Please circulate this website and send comments. Thanks.